Very small services on the A419, located just half a mile from the M5 motorway. 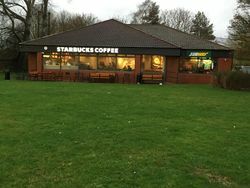 The current tenants of the former Little Chef Oldbury building: Starbucks and Subway. The service area is often referred to as 'Stonehouse' or 'Fromeside' services. Throughout most of the 2000s, several popular road maps marked the services as a non-primary A-road service area named 'Oldbury', despite not listing any other facilities like this. This may have been a deliberate exception to identify anyone copying their work. 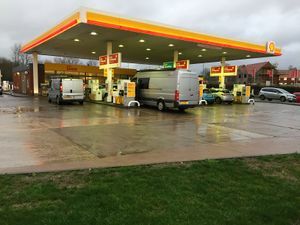 Even so, it raised the profile of what is otherwise an unremarkable service area: Oldbury was often used as an example in the map key, as it was usually the only non-primary service area in the whole map. Little Chef built the facilities here in 1986, with a Burger King later opening up inside it. The restaurants closed leaving the petrol station and the hotel. The Little Chef reopened, but closed again on 26 September 2012. On 16 August 2013, a new Euro Garages-operated Starbucks opened here. The Subway was later added.